Guest blogger and horror flick fan Tom Silvestro gives us a run down on NYC-set horror films. Although some of the greatest dramas have been set in New York City (Citizen Kane, Taxi Driver, The French Connection), it’s quite difficult to think up any in the horror genre. 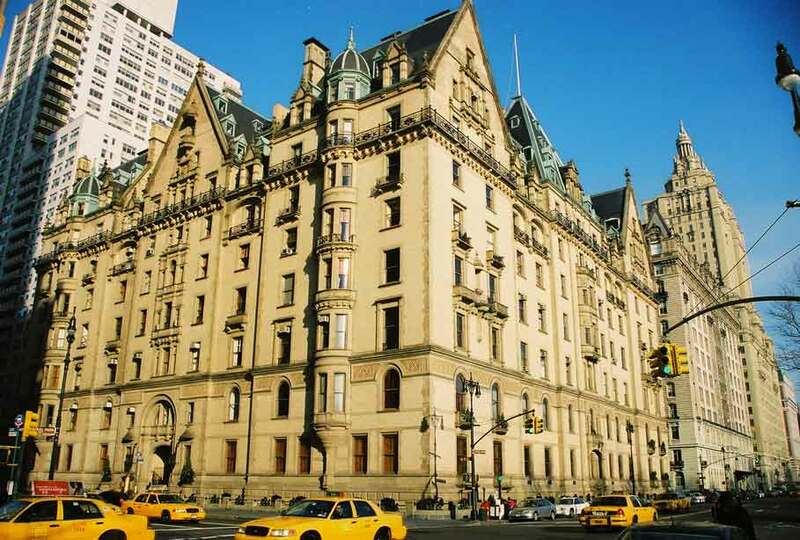 There’s Rosemary’s Baby, of course, which has some great spooky shots of The Dakota. And while more a thriller, Jacob’s Ladder does spotlight the nightmarish griminess of NYC’s underbelly. However, these are about the only two that could qualify as “horror classics” set in The Big Apple. Arguably more of a “giant monster movie” than a true horror film (like the NYC set Cloverfield), Q: The Winged Serpent (1982) piles on the B movie cheese. Following the trend of old monster movies, “Q” takes a fun movie idea of a dragon running amuck in New York City and pushes it into the background as random scientists, army guys, and newspaper reporters engage in a boring mystery plot (something about an Aztec artifact?). This is a “giant monster movie” pet peeve of mine: no one cares about the humans! (Cloverfield was an exception because it stayed with that handful of humans and didn’t cut to some “serious world leader meeting” cliché’ that most giant monster movies employ.) People just want to see dudes in lizard costumes crushing cheaply made model buildings. It’s similar to classic Jackie Chan movies – the writers try to shoehorn some lame story or love interest for Jackie, but people just want to see him perform cool stunts and comically fight people with ladders. And from the towering Chrysler Building we go to the smelly NYC sewer system. This is the location of the next crummy horror film: C.H.U.D. aka Cannibalistic Human Underground Dwellers (1984). Besides being the most memorably anagrammed movie next to E.T. and (to a lesser extent) D.A.R.Y.L., this movie’s bizarre title remains a mainstay “movie punch line” in comedy. I’d argue, though, that few have actually sat down and watched C.H.U.D. And having done just that…I have to agree that this movie should exist simply as a weird title for the occasional Daily Show reference and not as an actual motion picture that people watch with their eyes. C.H.U.D. is exceptionally terrible. It’s yet another movie that squanders its great B movie concept – cannibals in the NYC sewers! – in favor of a plodding storyline about disappearing homeless people. What a waste! This movie suffers most from the lack of editing. Scenes seem to go on and on and on and destroy any semblance of tension or “watchability.” Even the semi-famous cast (Daniel Stern, John Heard, and John Goodman in a blink-and-you’ll-miss-him cop role) look bored too death. Oh, what this movie could’ve been — People battling for survival against cannibal mutants in the catacombs of subway and sewer tunnels! But instead, we get actors looking way too serious and light PG-13 gore. The C.H.U.D.s themselves are actually pretty cool looking with their glowing eyes and Toxic Avenger-like skin. You almost feel bad for them, being stuck in such a lame movie. How do you liven up a sagging horror franchise? You could shoot the slasher into space (Jason X, Critters 4, Leprachaun 4: In Space) or introduce progeny (A Nightmare on Elm Street: The Dream Child, Seed of Chucky, C.H.U.D. 2: Bud the Chud). My favorite gimmick was taking the slasher on a vacation – get him out of those depressing campgrounds or random warehouses and plop him into the Bahamas (I Still Know What You Did Last Summer) or the gritty streets of L.A. (Leprachaun in the Hood, Leprachaun: Back to tha Hood) or somewhere more worthwhile (Ghoulies 3: Ghoulies go to College). It appears, even Ghoulies need an education. Taking a cue from Muppets Take Manhattan, Friday the 13th Part 8: Jason Takes Manhattan drops Jason in the Big Apple…well, a Big Apple that looks a lot like Vancouver, anyway. Jason Voorhies hacking away in New York? Sounds great, right?! Well, technically Jason’s only in New York for about the last twenty minutes. Much of the movie is spent on some sort of teen trip/booze cruise that’s in route to New York. I’m a big Jason fan and count “Friday the 13th Part 4” as one of my favorite “crazy anything goes slashers” – Corey Feldman, gore effects by Tom Savini, and Crispen Glover dancing are just some of the reasons this one rules. Having said that, #8 is my least favorite in the series. It moves at a snail’s pace, features unmemorable death scenes (aside from a death-by-electric-guitar scene), and the most irksome teen characters of any of the sequels. From Manhattan we move to Brooklyn with the Eddie Murphy vehicle “Vampire in Brooklyn” (1995). To be honest, I haven’t seen this one. Looking it up on its imdb page, I see that it was directed by the great Wes Craven and co-stars Angela Bassett and it doesn’t look half bad…until you get to the poster – a mugging Eddie Murphy stroking his chin with bizarre long hair that makes him look like Barry White. Oh yay, he even plays multiple characters! Hmm…it does say it was shot in Brooklyn, so it’s got that going for it. Sorry Eddie Murphy/vampire fans, but I’m going to have to pass on this one since I can safely assume that it’s garbage. To my knowledge “Murder Party” (2007) is the only horror film set in Williamsburg, Brooklyn. And that piqued my interest since it’s just a stone’s throw away from my Greenpoint dwelling. This little indie is easily the best of the NYC set bunch. Unlike the other schlocktaculars, this film has a great deal of merit and competence. It also makes good on its excellent title. It’s not some wasted premise or deep metaphor. There’s a party and people get murdered. Writer/director Jeremy Saulnier’s feature debut starts out strong with the simple concept of a lonely socially awkward man getting ready for a Halloween costume party. The dry comedy and manicured shots recall Napoleon Dynamite. Chris Sharp as the lead has the perfect balance of subtlety and goofiness. Just a shot of him making a “Knights That Say Nee” costume is funnier than it has any right to be. This wonderfully droll character introduction transitions into some great Shaun of the Dead-esque horror comedy sequences once the titular party gets going. However, the middle gets bogged down with numerous misguided art world zingers and one soon realizes there’s a lot of dead space in that giant warehouse location. This is especially apparent when a Breakfast Club reminiscent “pretentious group discussion” seemingly goes on forever. It’s a dramatic tonal and stylistic change-up that doesn’t quite work and almost grinds the movie to a halt. Thankfully, the movie gets back on track in its frenetic last act. The gory over-the-top finale more succinctly nails its art satire ideas and (more importantly) re-injects the murder back into the party. All in all, it’s a remarkable horror debut from Saulnier and I’m sure he’ll only get better and better over time. And I hope he keeps his movies set in NYC. This city deserves a better class of horror than C.H.U.D. Tom holds an annual Horror Marathon at Fort Awesome. When he is not watching films, he is creating his own sketch shorts with friends at Escape Pod Films.